05/09/2013: 11 babies, day 22 of the gestation period (13 born, 11 surviving). Honeymoon was born in October 2012 with Jemma at Isamu Rats and came to live here with my three same-age keepers from Monkeyshines and Flow's litters. Honeymoon is topaz, and was initially discounted from our breeding plans due to the potential health problems associated with the red-eye dilute (RED) gene - particularly issues around clotting and coagulation. However, she has developed into a strikingly fit and beautiful doe with a lovely mellow, bomb proof temperament, and she is licky and loving and enjoys spending time with people. 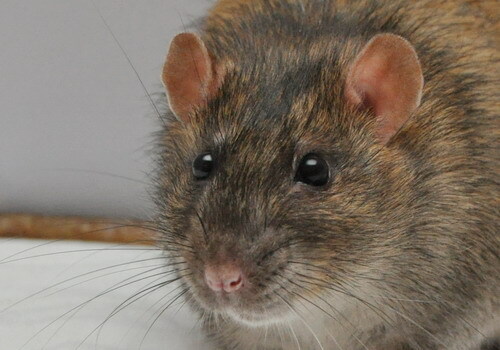 Tam is a nice long-bodied agouti top-ear buck with a beautiful head and expression. He has a very friendly and steady personality, and is a little more gentle and sensitive where Honeymoon is more likely to steam ahead! This is a close brother-sister inbreed in order to strengthen a number of core 'tabi' traits, and on balance, we judge the merits of this combination to be of significant value to our longer-term breeding aims. As I have two litters here myself at the moment, we decided that Honeymoon (and some of her friends) would return to Jemma to have her babies there, and enjoy undivided attention and care! The safety of the doe is of course of utmost concern to us, and because of the potential issues to do with Honeymoon's variety, we chose to test her clotting function by having a blood sample lab analysis. Her coagulation was found to work normally, so to the best of our knowledge there should not be any increased risk to her associated with birthing and blood loss (above that of any other doe) and indeed she went on to give birth without issue. We're expecting agouti babies, with a chance of Russian, self, RED, mink, cinnamon and dumbo. As this litter was born at Isamu Rats, I'm only including brief information here - for more photos and further info, please visit their litter page at Isamu!